This April 15th, our tax filing is complete, but we are extending our pre-order offer for two more weeks because the printing of Danger Quicksand – Have A Nice Day is taking longer than expected. a friend and receive this free coffee cup for yourself. Take advantage of this offer now. 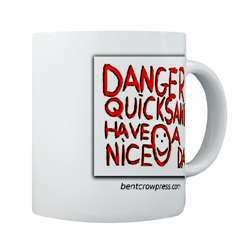 Get this Free Danger Quicksand coffee cup by pre-ordering a second copy of Danger Quicksand – Have A Nice Day. Copies of the books will begin shipping as soon as they arrive from the printer. David, I stumbled onto your blog while looking for self-publishing. I think you have lots of good advice. I have never tried self-publishing, but I really admire those who have taken the plunge! I was musing about self-publishing on my blog and I mentioned your blog as a good source of advice and real-life experince. Thanks for writing about your experiences.